The best way to get to know a community is by scheduling a tour. See the facilities, meet the staff and residents, and get a feel first hand what it's like to live at Trinity Oaks Of Pearland Assisted Living. 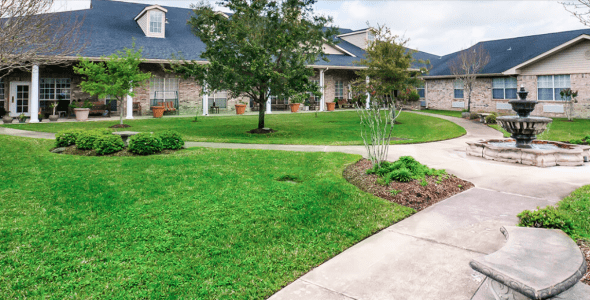 Trinity Oaks of Pearland offers a warm, respect-filled Assisted Living community conveniently located in the heart of Pearland, Texas –and within minutes of a major chain grocery store, local churches, community center and shopping. We provide both Independent Living and Assisted Living Apartments designed to feel like home, complete with privacy and security in place for all residents. Our staff works 24 hours a day to meet our residents’ needs and provide for their well-being. We are committed to assuring our residents’ spiritual needs are met, and that our community reflects the love and care that emanates from our Christian faith. Living at Trinity Oaks is not only comfortable, it is affordable. We offer easy-to-understand service plans. Our professional staff assists in the development of service plans tailored to meet the unique needs of each resident. Trinity Oaks’ service and care levels are designed with the dignity of the residents in mind and with the goal of maintaining independence for as long as possible. Each resident is carefully and thoughtfully assessed during the application process to determine the most appropriate level of care. Additionally, there are regularly scheduled evaluations to ensure each resident is receiving the most appropriate care. For Independent Living and Assisted Living, we offer our residents studio, one- and two-bedroom floor plans.